Paella Sunday is up and hot on the table! The other day we visited the town of Porto Cristo for Paella with a view! Now I know what you are thinking, what do Looney Tune characters and a restaurant have in common... the answer is simple, NOTHING! My guess is that they have had these extremely Kitschy design for years and thought it was a good idea so it stuck! 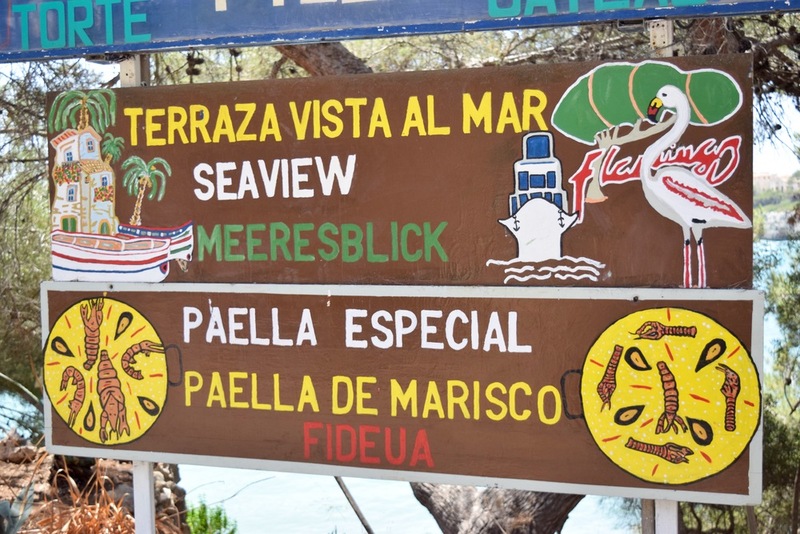 Let's look past the signage and at the view...and the pièce de résistance... PAELLA! From my ongoing quest for Paella, I have found everyone, every restaurant has it's own style! This can also be said that every person has their top priorities of what is of importance. We at LTM are covering Marisco/Seafood Paella only. The first thing we look for in a good Paella is its key ingredient, the rice, but also the Socarrat which forms at the bottom of the paella pan when the liquid is rendered and the rice has reached its peak of perfection! Then it's always which type of seafood and the quality! We are in Mallorca and if I am paying 25€ (or higher) per person I hope to have a few gambas de Sóller, and cooked for a short period of time so they are still juicy and full of flavor. Are you hungry yet? Flamingo restaurant in Porto Cristo boasts a beautiful sea view and since it's situated on the cliff side above the beach it's very tranquil and enjoyable. The Restaurant is very large with multiple levels of seating so reservations are not essential. The paella here was different than in most places as we had a reverse Socarrat and the top of the rice and shellfish has a nice char on it. This made the rice slightly crispy, and overall enhanced the taste of the dish. This however did not fair well for some of the shellfish that was in smaller pieces. The mussels were perfectly cooked and I was fortunate to have plated the giant claw that retained some of the stock and when mixed back into the crispy rice was a winning bite! Overall I was beyond satisfied with this Paella and all combinations of having a relaxing Sunday off worked for me!